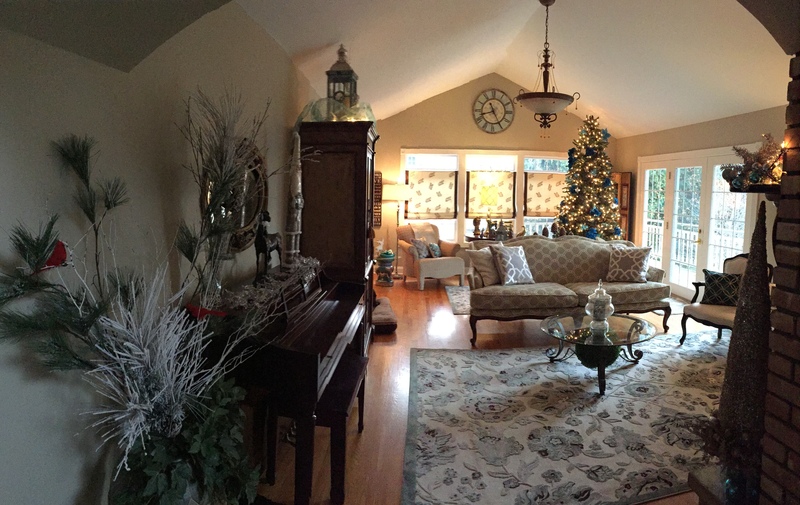 Spring is the perfect time to give your home a fresh look. From serene shades to vivid hues, I have 5 color schemes you’ll want to try this season. Turquoise and tomato red according to some design experts are new hues for this season. I know turquoise??? red????? haven’t these colors been popular for a while?? Well, yes but it is definitely the HUE, that so subtle difference in color that creates new trends, and also the way we pair colors together that creates news. Here is a great example of the new pair that was a color faux pas in the past, pink and red. Don’t shy away from color this season. 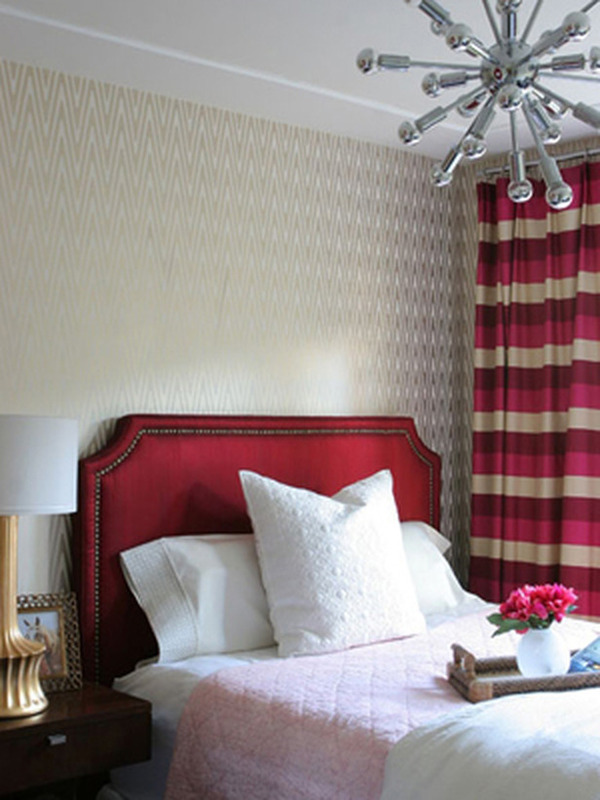 Designer Erinn Valencich pairs classic red with hot pink for a bold bedroom design. By using gold and cream in the bedding and wallpaper, she keeps the vibrant shades from overpowering the space. 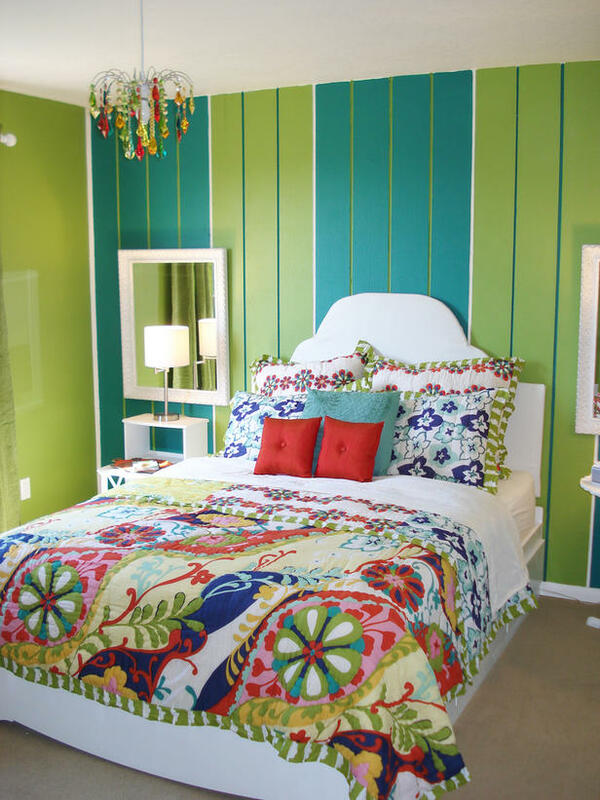 Spring hues are ideal for a girl’s bedroom. 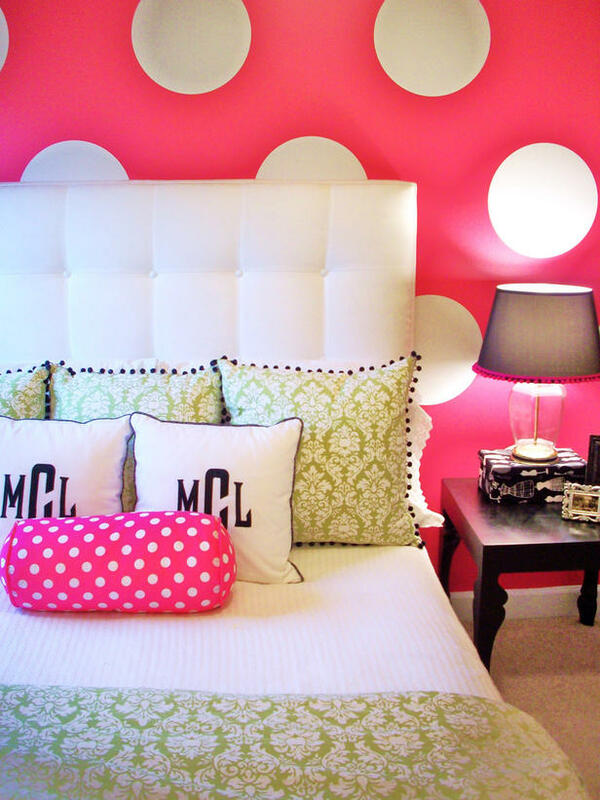 Using a polka-dot pillow as inspiration, this designer uses a focal wall to set off the room. Damask fabric in apple green complements the vivid pink wall, while a white headboard and bedding give the space a crisp, fresh look. I just love Damask, its one of my favorite patterns. Having two girls of my own, pink is a color that has adorned their rooms for many years, it is always in style for girls, from nursery to teens and beyond. One of the most appealing shades of spring is the deep blue found in this bedspread. It’s combined with other favorite hues, like tomato red, turquoise and apple green, to create an energetic and bright design. The mix of patterns here is just exquisite, when pairing patterns small and bold always work with a linear stripe. The pop of white in this headboard again keeps that crisp sharp feeling in the room. The classic blue and yellow combo is always a favorite. While white is often paired with this palette to keep it light and airy, black accents to create a richer, more sophisticated atmosphere. Pairing together a calming relaxing green with neutrals are a safer choice and using deeper hues of the same shades as accents, create a great space and inviting atmosphere. This trend is so popular I have added two pictures for you!! 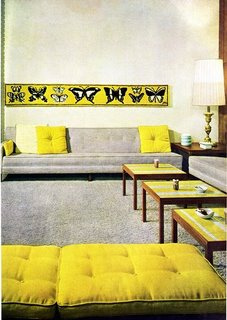 Loving the fresh bright sunshiny yellow paired with the subtle grey!! Neutrals continue to flourish, as companions for brighter hues or as standalone, monochromatic color schemes. Which neutral might just surpass brown as the favorite? Gray. And it covers a wide range of hues, which span soft gray to charcoal to hematite, and gain interest from metallic and pearlescent accents. Green continues to gain strength from its association with the growing shift toward eco-consciousness. It will show up in everything from fabrics to accessories to countertops. I hope you have enjoyed my forecast on whats new and upcoming in color!! As always stay tuned…..